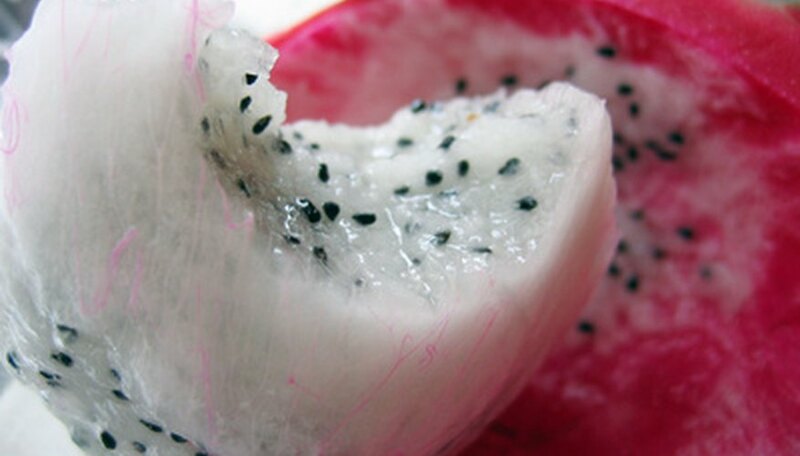 Dragon fruit hails from tropical America and grows naturally in northern South America and southern Mexico. Due to a demand for exotic fruits and the high amounts of antioxidants found in dragon fruit, it is grown commercially in some areas of North America, particularly in California and Florida. According to the UC Small Farm Program and Cooperative Extension, over 25 species of dragon fruit exist. They are produced for use in ice cream or beverages and for fresh eating. "David Bowie" is a H. undatus dragon fruit species. This variety weights ½ to 1 lb each and is marked by a bright pink peel with green scale margins. The pulp is white and has a sweet and tangy flavor. Data from the University of Florida says that this dragon fruit variety has origins in California. "Purple Haze" dragon fruit has a dark pink peel with green scales. The pulp is dark pink with comparatively few seeds. It bears a sweet flavor similar to that of kiwi fruit and grapes. This H. undatus species typically weighs 1 to 2 lb each. "Purple Haze" originates in California. "Harpua" is a H. undatus species signified by a bright pink peel and green scales. The fruit weighs approximately ¾ to 1 lb. The pulp is white and bears a semisweet flavor. This dragon fruit variety originates in Central America. "Lake Atitlan" dragon fruit is a H. guatemalensis species that originates in Guatemala. It is named for a Guatemalan lake found among volcanoes of Central America. According to the University of Florida, this variety weighs ¾ to 1 lb each. The peel is bright pink with green scales and the pulp is white. "Lake Atitlan" is marked by a tangy, sweet flavor. "Yellow Dragon," a Selenicereus megalanthus species, originates in Florida. The peel of this variety is significant for its bright yellow peel with green tinged scales. The pulp is white and yields a sweet flavor. This variety bears fruit weighing in at ½ to ¾ lb each. It is significant for thorns that appear on the fruit. According to the University of Florida, "Zamorano" dragon fruit comes from Honduras. A H. ployrhizus species, this variety is marked by a red peel and scales with green margins. The pulp is red and bears a mild, sweet taste. Zamorano fruit usually weighs ½ to 1 lb each.